Following up from last article on standard remotes, today lets talk about Baggage Bots! Like the standard remotes, most factions have access to a comparable set of baggage equipped remotes. There are typically three profiles available, all of which are slower, but more well armored than their standard counterparts. Nothing on their profile is that remarkable. Their CC and BS are low, as you'd expect from a remote, with standard WIP, and decent protection with ARM 2 and BTS 3. They aren't fast like most other remotes, but they do have one thing that makes them unique, Baggage. This handy special rule does a ton of different things. First of all, the model counts as an additional 20 Victory Points, this is important, because it's used when calculating Victory Points, but not Army Points, the distinction is important in scenarios like Annihilation which award points for killing Army Points. These 20 extra points are factored in however when calculating Retreat!, so will give you a higher threshold before running away. Additionally, scenarios which have scoring zones (such as Frontline or Safe Area), mention that baggage troops are worth an additional 20 points for scoring these zones, which is huge, since now a mere 8 point remote can hold down a section against one or two enemy Light Infantry. The other main task of Baggage is to refill disposable weapons. Keeping a Baggage model near your panzerfaust will let them spend short skills to remove the Unloaded state, giving them a full complement of panzerfaust again. This can be done with mines, deployable repeaters, panzerfaust, drop bears, etc. If you're taking a bunch of disposable weapons, it's worth considering some baggage to keep them toped up. Minesweeper. This is your standard baggage-bot, it doesn't do a whole ton, but it does provide you with a repeater, and minesweeper, as well as Baggage. Minesweeper is a rule that can go very well in your favor, or be totally useless. If your enemy has any Net Rods, Imetrons, or other equipment that is worth minesweeping, then it's hilarious to do so. Taking over enemy Drop Bears is a personal favorite, just remember that mines will need to be revealed first, before being taken over. Really though, if you're taking this guy, it's because it's an 8-point regular order, and possibly to help your repeater coverage so that you can use supportware on more effective remotes. EVO Hacking Device. Okay, this does all the things. Essentially a hacking device, plus a bunch of extra utility, the EVO is a piece that you can build entire lists around. +3 PH for Airborne Deployment. Ignore -6 WIP for Sat-Lock. Allowed to use Hacking Programs in a Coordinated Order. Allowed to use a Command Token for a re-roll on a Hacking attempt. Allowed to use a Command Token to start the game with an EVO program running. Wow! From the top, that +3 PH for Airborne Deployment can be huge, when playing Biotechvore, this will nullify the penalty for using AD. Since this is a passive bonus, and doesn't require spending an order to activate, it is immediately, meaning if you have Yuan Yuan, they'll be landing on 14's instead of 11's (Ikari loves EVO). Ignoring the -6 WIP penalty for Sat-Lock is a great option for more advanced players who use Sat-Lock well. In armies like Imperial Service, which have access to a lot of sniffers, you can be Sat-Locking models all over the table, before raining down the pain with grenade launchers or smart missile launchers. Finally, if you have a hacking heavy list, both passive bonuses go a long way to help you beat down enemy hackable targets through coordinated orders. If the enemy fails, or rolls low with their Reset, the re-roll can be very significant. The four support-ware programs are all very defensive. 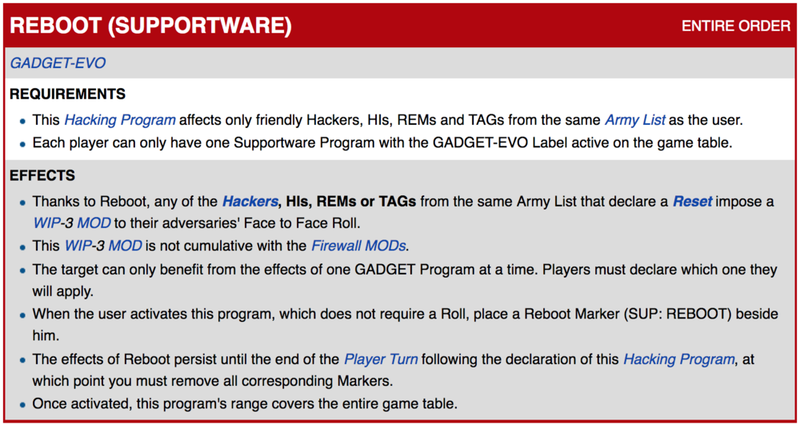 Kaleidoscope and Reboot do a great job to help protect you from enemy hackers, imposing extra -3 penalties on them, which when combined with programs like Redrum, Counterstrike, or even worse, Lightning, can really make it hard for the enemy to hack. 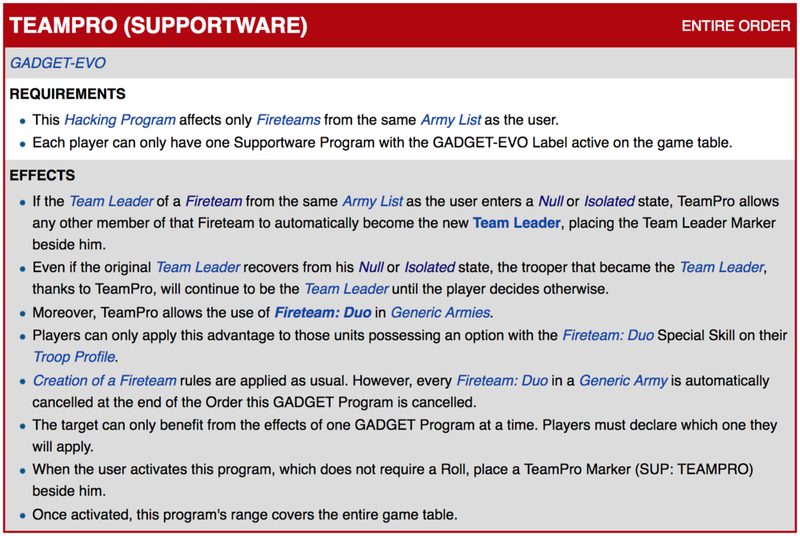 TeamPro is an easily overlooked program, but I think one that is nearly critical for Ikari, letting you pick a new team leader when the active one goes down. This will help Ikari because many of their links are ineligible to reform after losing a member (due to strict, inflexible, link team requirements). Finally, Overclock is a load of fun, effectively working like Enhanced Reaction, except it applies to ALL remotes with repeaters in your army. Combine Overclock with NCA who get 3 Fugazi and a few Pathfinders, and suddenly your army has to march through a laser light show, getting blinded from all directions (remember you can use a command token to start with this program active). If all that wasn't enough, they still have access to a lot of the standard hacking programs, and most importantly, the regular Supportware programs. Don't forget that the EVO fulfills the Hacker requirement of taking Remotes! E-Drone. Worthy of some extra attention, the E-Drone is a whole other beast. It carries the same hacking device as above, but loses Baggage in exchange for a combi rifle and it's own hacking programs, Exile and Goodnight. Able to supply itself with supportware, it can be a mock Total Reaction remote by giving it Assisted Fire and putting it into suppressive fire. Goodnight is a fun extra program that lets you finish off any unconscious enemy Remote Presence models, preventing the enemy from repairing. Additionally, should any enemy Fireteams come within hacking radius, the E-Drone can hack to isolate one of the members, even if the target is not normally hackable! Downright terrifying, and even effective against Ariadna sectorials and Tohaa. Total Reaction, Repeater. This is probably the least common profile of the humble baggage bot, but I think it's about to make an appearance in more of my lists. Much of the reason they get passed up is because they aren't much cheaper than a standard Total Reaction remote, only 4 points and 1 SWC cheaper, why would someone be crazy enough to take one? First off, the SWC cost is a big deal in some factions, especially Ikari, so having a point defense piece that lets you still take other big guns is pretty nice. What's really killer about them is that they're worth a whopping 41 points for securing zones! One of them alone can stop most HI in the game from taking a bit of territory, and they're pretty capable at defending themselves with not only Total Reaction, but also by being a Repeater, so your own hackers can stop enemies that are advancing into their area. Being a repeater themselves also means they can always be given Assisted Fire, which makes a combi rifle a much more deadly prospect. Finally, the HMG isn't always the best choice of weapon, which may come as a shock. When defending an area that is going to have closer range engagements, a combi rifle is going to have that +3 range, instead of the HMG's +0, or even -3, if you have a Kameel it gets even better with a total reaction light shotgun when the enemy gets too close. So despite all coming from the same unit, the three profiles are all incredibly different on the table. The minesweeper is a cheap regular order with some potential shenanigans, though highly situational. 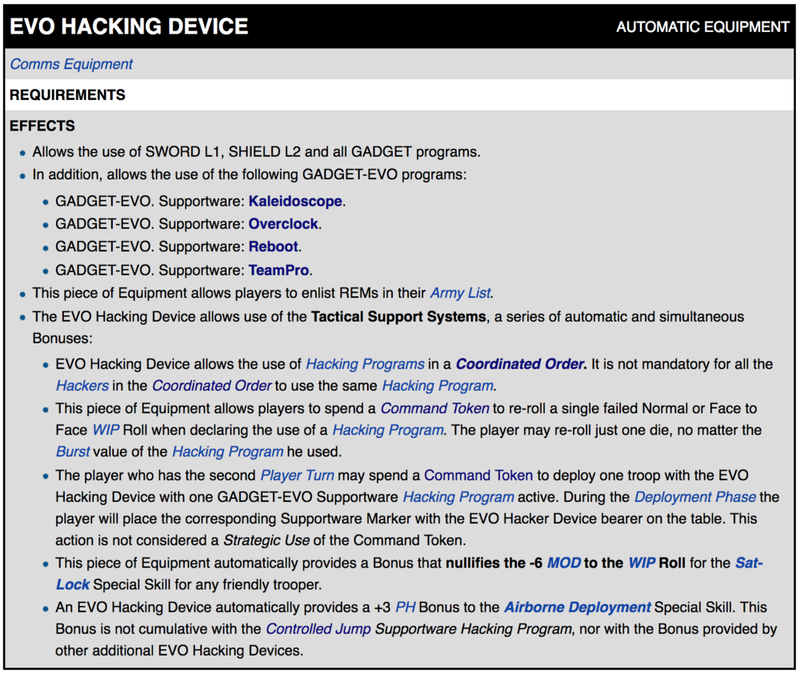 The EVO hacking device is fantastic for it's synergy with friendly Airborne Deployment, Sensor, and Hackers, as well as it's ability to provide Supportware for other remotes. Finally the maligned Total Reaction profile, which really just needs the right attention and scenarios, but when used well, I think can be a very effective piece.